Case the Designer for Global Design Project - Twice! 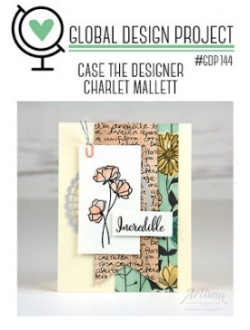 The Global Design Project challenge this week is to CASE (copy and selectively edit) the Designer, and this week it is a lovely design by Charlet Mallett. She has a beautiful card with many wonderful layers, giving us lots of elements to play with for our CASE. Today I needed to make cards for two very special people, so I decided to CASE Charlet’s card twice! Here is her card. And here are the two cards I created. I started to create my cards, and as I did I wanted to add some special elements. I turned to my favourite tool, the Big Shot to help out. I use my Big Shot in some way for almost every project I create. I love how it makes it so easy to create texture and special elements for our cards and other paper-crafting projects. For these cards I used the Petal Pair TIEF to add texture, and the Eastern Medallions Thinlits Dies to create my version of a doily. It was quick and easy, and really steps up the cards. Most elements are the same in both cards, but I did use two different greetings from the Love What You Do stamp set. I also decided to mount my textured piece of Pear Pizzazz card stock in two different ways. Right side up, and upside down. Since there is no right or wrong here, you can pick which one you want to be which! I cut a banner end in my greeting, adhered it with dimensionals and finished the cards off with a little bow made from Nature’s Twine in Crumb Cake. There you have it. Two beautiful cards for two special people, ready to go.